1823 Nashville Toll Bridge Site - The first bridge in Nashville was built over the Cumberland River and opened in 1823. Thousands of Cherokees crossed this bridge on the Trail of Tears in 1838. One of the bridge abutments still stands on the river bank in downtown Nashville. Chickasaw Treaty Site - In Nashville, Tennessee, the location of treaty negotiations, held in 1783, between the Chickasaw Nation and the early Nashville settlements. David Crockett State Park - In Lawrenceburg, Tennessee, is named for the Tennessee frontiersman who opposed the Indian Removal Act of 1830 and fought and died at the Alamo in Texas in 1836. Mound Bottom Site - A large, 1,000 year-old Mississippian Period town site located on the Harpeth River in Cheatham County, Tennessee. Noel Cemetery - The Noel Cemetery was a large Mississippian burial ground that contained an estimated 3,000 graves, located in Nashville, Tennessee. Old Jefferson - A section of the Trail of Tears National Historic Trail crosses the Old Jefferson Site, located on Corps of Engineers property in Rutherford County, near Smyrna, Tennessee. Old Stone Fort State Archaeological Park - A Woodland Period ceremonial enclosure near Manchester, Tennessee, owned by the state and operated as a Tennessee state park. Sellars Farm State Archaeological Area - A Mississippian town site near Lebanon, Tennessee, owned by the state and managed by Long Hunter state park. Tennessee State Museum - Located in Nashville, Tennessee. Has a permanent exhibit titled "First Tennesseans" with Artifacts from the Paleolithic, Archaic, Woodland, and Mississippian periods on display. 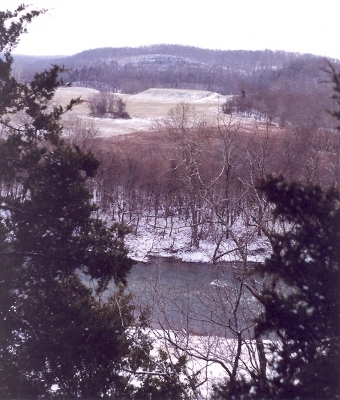 Mississippian platform mound at Mound Bottom with a light dusting of snow, Harpeth River in the foreground. Cheatham County, Tennessee.